US taxpayers will have to pay as much as twice the GDP of Germany to just cover interest payments on government debt over the next decade according to the Congressional Budget Office (CBO). They say the government will spent $900 billion more than it will receive in taxes, with the deficit projected to top one trillion in 2022. “In CBO’s economic forecast, which underlies its budget projections, the economy expands more slowly over the next decade than it did in 2018, averaging annual growth of 1.7 percent over the 2020– 2029 period. The slowdown begins in 2019 as the positive effects of recent tax legislation on business investment are expected to wane and federal purchases under current law are projected to drop sharply starting in the fourth quarter of the year. US government financial projection for the 20s, Jan 2019. Mandatory spending is Social Security, Medicare and Medicaid. Discretionary spending is for everything else. Some $700 billion of that circa $1.3 trillion in discretionary spending is to go to the military. $600 billion is left for everything else. About half of that $600 billion is to go towards interest payments, rising gradually until they overtake military spending mid-way through the 20s. The debt capital itself will keep on growing if current policies remain in place. Only public debt is included above at about $16 trillion. Overall debt including other government departments is at about $21 trillion. Military spending could potentially be reduced following Trump’s declaration that ISIS has been defeat and a potential peace treaty with the Taliban as well as a potential peace treaty in Korea. As things stand however, military spending is likely to increase from $590 billion to $686.1 billion. “Customs duties, which are assessed on certain imports, have totaled about 0.2 percent of GDP in recent years, amounting to $41 billion in 2018. 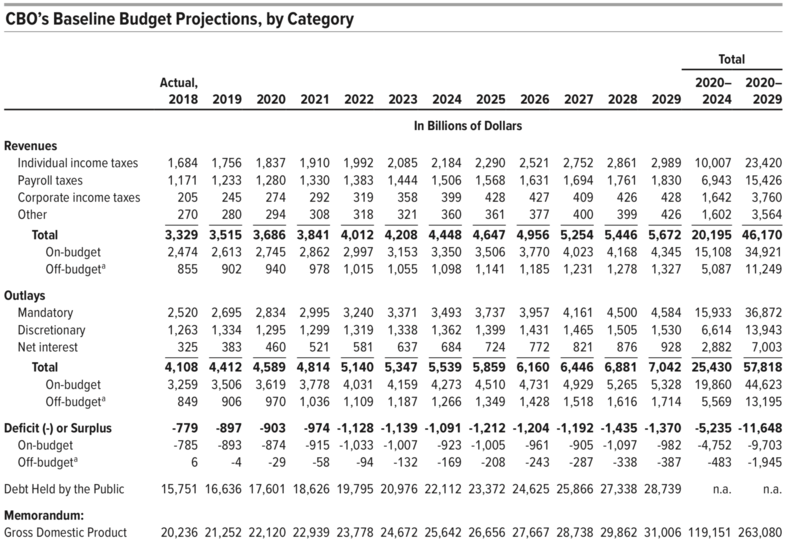 CBO projects that those receipts would increase to 0.3 per- cent of GDP in 2019 and remain between 0.3 percent and 0.4 percent of GDP through the next decade. With little room on spending, save for the military where Trump wants to increase spending, it may be that taxes will have to increase. That however might be unpopular as the economy is now growing at a lower rate than inflation. US GDP grew by 2.3% according to CBO, significantly down from the projected 3.1% and lower than current Fed interest rates of 2.5%. With a sluggish economy, an increase in taxes might lead to social unrest as in France. Thus potentially leaving only stealth taxes as an option, that being money printing. Even there, however, the Fed is no longer buying as much government debt anymore. The bankers now want to be paid back what they lended at an interest rate of nearly 0% through quantitative easing in the last decade. The fish so caught and the debt spiral laid where the government has to borrow just to pay back what they borrowed, they now want to be paid an interest rate of 2.5% which may increase to 3% or more this year. Government deficit to GDP, Jan 2019. “The Treasury’s total net new issuance in 2018 amounted to $1.34 trillion, more than double the 2017 level of about $550 billion. In 2019, it will be $1.4 trillion, with $1.11 trillion from more coupon-bearing debt and the rest in bills, according to forecasts from Steven Zeng of Deutsche Bank,” says Bloomberg. That means the public has to give the government $1.4 trillion this year by buying its debt promissory notes. If they don’t, the government is bankrupt and bankers move in to sell parks and other public assets as they did in the 70s New York. Here moreover it isn’t quite the public that decides whether they should or should not buy the debt. It is first instead the bankers who decide whether they will or will not market the debt, as in offer it to the public to buy. In this way, bankers have an immense power over the government for they can demand something to be done or they won’t market the debt, meaning the government would have to face bankruptcy. In this digital age the government could of course tokenize the debt and directly offer it to the public through the blockchain, but they haven’t quite moved in that direction so far presumably because $1.4 trillion is quite a lot of money. The crypto market, moreover, is pretty small in the grand scheme of things, but you’d think they’d want to test it with small amounts at least as a backup. Otherwise, we might have elections, but the real power is with the intermediary market makers of these huge debt levels. That being the bankers.